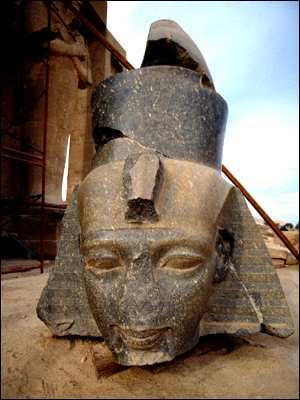 This is part of a large stone statue of the pharaoh Ramesses II. It is can be found in a temple near Thebes called the Ramesseum. 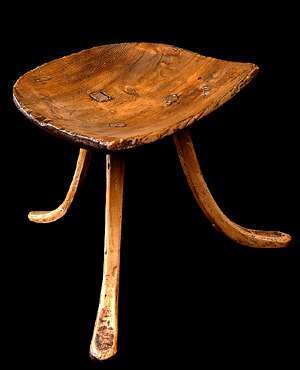 This wooden stool would have been a prized possession in ancient Egypt, as most ordinary people sat on reed mats rather than on chairs. In fact, it was a great honour to be offered a chair at a banquet in ancient Egypt. These are metal containers made by ancient Egyptian craftsmen. 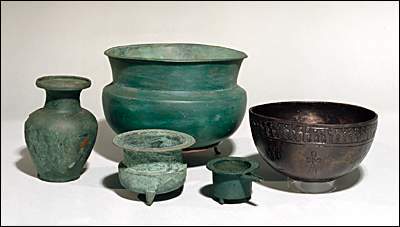 The green containers are made out of bronze, a metal which turns green with age. 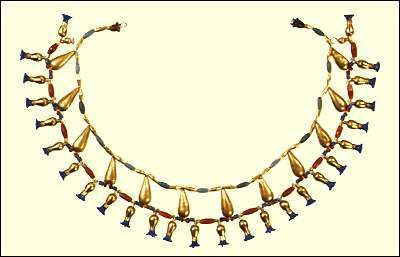 This necklace is made with beads of gold, glass, carnelian, red jasper and glazed composition. The dangling blue beads are in the shape of cornflowers. Back to Trades home page.